At The Rose Theater, we believe everyone deserves a chance to experience the magic of the theater. 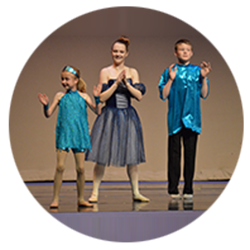 Performances and classes are open to children and family members of all abilities. We are committed to removing obstacles and opening up new opportunities for people with disabilities. The Rose endeavors to offer its staff professional development opportunities and to offer career opportunities for people with disabilities. A few of the accommodations available to individuals who need them are listed below. If you require additional assistance, please contact The Rose Box Office and we will do everything we can to accommodate your needs. Wheelchair access to The Rose is available from all public entrances. The Rose offers wheelchair accessible seating on its main floor. Depending on the size of the wheelchair, up to ten spaces are available per show. If you require special seating, please call The Rose to ensure availability. Courtesy wheelchairs are available for guests who need assistance. Several parking spaces are available for patrons with disabilities directly outside The Rose Theater. Up to six spaces are available on Friday evenings. Ten spaces are available on Saturdays and Sundays. Wheelchair accessible restrooms are located in the lower lobby and on the mezzanine. Individual, single-user restrooms are available on the mezzanine. An elevator is available for those needing access to the lower lobby and mezzanine levels. 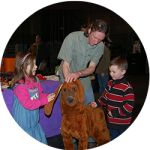 Judy Moody & Stink: The Mad, Mad, Mad, Mad Treasure Hunt, Saturday, September 15 @ 2 p.m. The Very Hungry Caterpillar & Other Eric Carle Favorites, Saturday, October 6 @ 2 p.m.
Goosebumps: Phantom of the Auditorium – The Musical, Saturday, November 3 @ 2 p.m.
Elf the Musical, Saturday, December 15 @ 2 p.m.
Return to Niobrara, Saturday, December 15 @ 2 p.m. The Doll Maker’s Gift, Saturday, March 2 @ 2 p.m.
Winnie the Pooh, Saturday, March 30 @ 2 p.m.
Dragons Love Tacos, Saturday, May 4 @ 2 p.m.
Roald Dahl’s Matilda the Musical, Saturday, June 15 @ 2 p.m.
To reserve seating for ASL interpretation shows, please call the Box Office at (402) 345-4849. 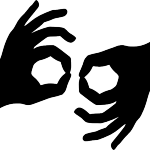 The Rose offers several classes that are ASL-intepreted for students who are deaf or hard of hearing. Scholarships are available for students in need of financial assistance. For more information about these classes, please email the Class Coordinator at classes@rosetheater.org. Assistive listening systems are available during mainstage shows for audience members who are deaf or hard of hearing. Please contact the Box Office for more information. 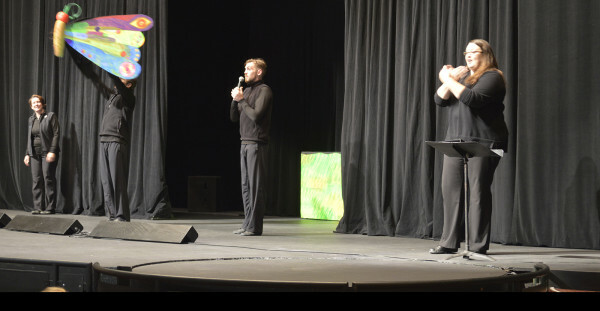 Audio Description involves the accessibility of the visual images of theater for people who are blind, have low vision or who are otherwise visually impaired. It is a narration service (provided at no additional charge to the patron) that describes the action taking place on stage. 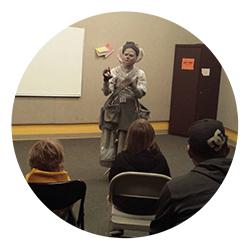 Spoken commentary and narration guides the listener through the presentation with descriptions of scenes, settings, costumes, body language, and more. The user hears the audio description via a small earpiece. To request audio description services, please call (402) 502-4637. Please make your request at least two weeks prior to the performance to guarantee availability. Requests made with less than two weeks before the show will be honored to the best of our availability. Large print programs are available for guests with visual impairments. Please visit the Box Office to obtain a large print program. If you require a program translated into Braille, please call (402) 502-4637 at least one week prior to your visit so we can arrange for the printing of your program. Students with visual impairments may take part in a free touch tour of The Rose mainstage before attending the performance. Call the Box Office prior to the performance for more information. Select performances are designated as sensory-friendly. Judy Moody & Stink: The Mad, Mad, Mad, Mad Treasure Hunt, Saturday, September 15 @ 5 p.m. The Very Hungry Caterpillar & Other Eric Carle Favorites, Saturday, October 6 @ 5 p.m.
Goosebumps: Phantom of the Auditorium – The Musical, Saturday, November 3 @ 5 p.m.
Return to Niobrara, Saturday, December 15 @ 5 p.m. The Doll Maker’s Gift, Saturday, March 2 @ 5 p.m.
Winnie the Pooh, Saturday, March 30 @ 5 p.m.
Dragons Love Tacos, Saturday, May 4 @ 5 p.m. The Rose has presents two productions designed for first-time audiences as a part of our FIRST STAGES series: Point A to Point B and Wynken, Blynken & Nod. These shows are presented in a sensory-friendly environment with minimal lighting changes, no full black-outs and gentle sounds. The shows are performed on our smaller Hitchcock Stage that allows for a more intimate setting and often features nontraditional seating. This environment gives students the opportunity for active engagement and interaction. Please call or stop by the Box Office for more information. To reserve tickets for autism-friendly performances, please call the Box Office at 402.345.4849. The Rose offers year-round classes for students on the Autism Spectrum. Scholarships are available for students in need of financial assistance. For more information about these classes, click here or email the Class Coordinator at classes@rosetheater.org. Interested in applying for jobs? We welcome applicants from all backgrounds of life. Click here to learn more about employment at The Rose.